Better than bacon on the Foreman! NBC Universal is auctioning off props and wardrobe from The Office. Happy Holidays from OfficeTally and the inimitable Kate Flannery. 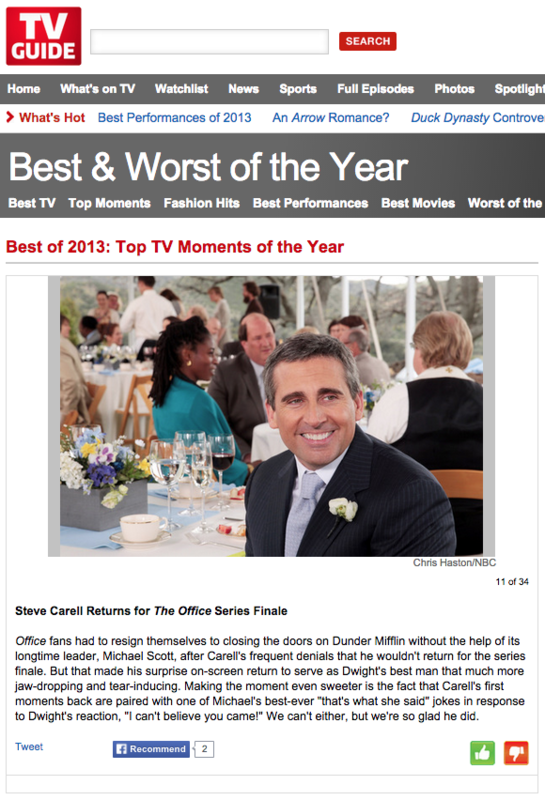 TV Guide has included ‘The Office’ in its “Top TV Moments of the Year” list! In case you missed it, Paul Rudd hosted Saturday Night Live last weekend. During his opening monologue, his fellow ‘Anchorman 2’ cast members Steve Carell, Will Ferrell, and David Koechner joined him onstage for an accapella version of the 1976 hit ‘Afternoon Delight,’ along with musical guest One Direction.